From New York Times bestselling author Cynthia Hand comes a riveting original novella (available only as an ebook) set in the world of the Unearthly series. Clara is desperate to get away—from the memories that haunt her in Wyoming and the visions of a future she isn't ready to face—and spending the summer in Italy with her best friend, Angela, should be the perfect escape. . . .
For as long as she can remember, Angela has been told that love is dangerous, that she must always guard her heart. But when she met a mysterious guy in Italy two years ago she was determined to be with him, no matter the costs. Now she must decide whether she can trust Clara with her secret, or if telling her the truth will risk everything she cares about. Alternating between Angela and Clara's perspectives, Radiant chronicles the unforgettable summer that will test the bounds of their friendship and change their lives forever. though he knew he should let me fly away." I've been looking forward to this novella and, as you can see, I wasted no time getting right to it. I love this story so much, and I'm very excited to find out what Ms. Hand has in store for these amazing characters. I'd love to know what your Teaser is! Awesome teaser! I need to read this! Not the way I would want to be looked at. Great teaser. Please check out my teaser. I love this series. I'm really looking forward to the third one! Ohh you are already reading this! LOve that quote! Happy Tuesday! Nice! I know I don't have to say it, but... yeah, still need to read the 1st book. Lovely! 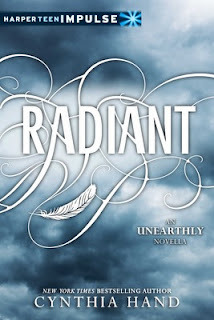 I still need to read Unearthly. Thanks for sharing! What a teaser! It caught my interest! Yayyy! Isn't the series awesome?? Enjoy Radiant!